1. Bannenberg JJ, Meijer DW, Bannenberg JH, Hodde KC. Hand-assisted laparoscopic nephrectomy in the pig: initial report. Min Invasive Ther Allied Technol 1996; 5:483-487. 2. 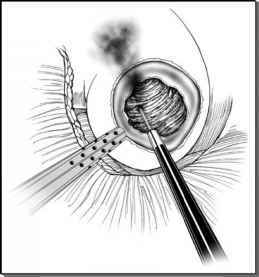 Nakada SY, Moon TD, Gist M, Mahivi D. Use of the pneumo sleeve as an adjunct in laparoscopic nephrectomy. Urology 1997; 49(4):612-613. 3. Slakey DP, Wood JC, Hender D, et al. Laparoscopic living donor nephrectomy: advantages of the hand-assisted method. Transplantation 1999; 68:581. 4. Stifelman MD, Sosa RE, Andrade A, et al. Hand-assisted laparoscopic nephroureterectomy for the treatment of transitional cell carcinoma of the upper urinary tract. Urology 2000; 56:741. 5. Wolf JS, Seifman BD, Montie JE. Nephron sparing surgery for suspected malignancy: open surgery compared to laparoscopy with selective use of hand assistance. J Urol 2000; 163:1659-1664. 6. Wolf JS Jr., Moon TD, Nakada SY. Hand-assisted laparoscopic nephrectomy: comparison to standard laparoscopic nephrectomy. J Urol 1998; 160:22. 7. Wolf JS Jr., Tchetgen MB, Merion RM. Hand-assisted laparoscopic live donor nephrectomy. Urology 1998; 52:885. 8. Clayman RV. Ramon Guiteras lecture. American Urologic Association Convention, 2000. 9. Clayman RV, Kavoussi LR, Soper NJ, et al. Laparoscopic nephrectomy: initial case report. J Urol 1991; 146:278. 10. Portis AJ, Yan Y, Landman J, et al. Long-term followup after laparoscopic radical nephrectomy. J Urol 2002; 167:1257. 11. Ono Y, Kinukawa T, Hattori R, et al. The long-term outcome of laparoscopic radical nephrectomy for small renal cell carcinoma. J Urol 2001; 165:1867. 12. El Fettouh HA, Rassweiler JJ, Schulze M, et al. Laparoscopic radical nephroureterectomy: results of an international multicenter study. Eur Urol 2002; 42:447. 13. Gill IS, Matin SF, Desai MM, et al. Comparative analysis of laparoscopic versus open partial nephrectomy for renal tumors in 200 patients. J Urol 2003; 170:64. 14. Stifelman MD, Sosa RE, Nakada SY, et al. Hand-assisted laparoscopic partial nephrectomy. J Endourol 2001; 15:161. 15. Ratner LE, Montgomery RA, Kavoussi LR. Laparoscopic live donor nephrectomy. A review of the first 5 years. Urol Clin North Am 2001; 28:709. 16. Ruiz-Deya G, Cheng S, Palmer E, et al. Open donor, laparoscopic donor and hand-assisted laparoscopic donor nephrectomy: a comparison of outcomes. J Urol 2001; 166:1270. 17. Wolf JS Jr., Merion RM, Leichtman AB, et al. Randomized controlled trial of hand-assisted laparoscopic versus open surgical live donor nephrectomy. Transplantation 2001; 72:284. 18. Nakada SY, Fadden P, Jarrard DF, et al. Hand-assisted laparoscopic radical nephrectomy: comparison to open radical nephrectomy. Urology 2001; 58:517. 19. Nelson CP, Wolf JS Jr. Comparison of hand-assisted versus standard laparoscopic radical nephrectomy for suspected renal cell carcinoma. J Urol 2002; 167:1989. 20. Hernandez F, Rha KH, Pinto PA, et al. Laparoscopic nephrectomy: assessment of morcellation versus intact specimen extraction on postoperative status. J Urol 2003; 170:412. 21. Meraney AM, Gill IS. Financial analysis of open versus laparoscopic radical nephrectomy and nephroureterectomy. J Urol 2002; 167:1757. 22. Velidedeoglu E, Williams N, Brayman KL, et al. Comparison of open, laparoscopic, and hand-assisted approaches to live-donor nephrectomy. Transplantation 2002; 74:169. 23. Bishoff JT, Allaf ME, Kirkels W, et al. Laparoscopic bowel injury: incidence and clinical presentation. J Urol 1999; 161:887. 24. Gill IS, Kavoussi LR, Clayman RV, et al. Complications of laparoscopic nephrectomy in 185 patients: a multi-institutional review. J Urol 1995; 154:479.